With new techniques and materials available, quilters are creating ambitious fabric artworks that can hang next to any painting. Katherine Knauer, Solar City, 2011, 86 x 86 in. Miriam Nathan-Roberts, Changing Plains (detail), 1992, 74 x 72 in. Mary Ann Tipple, The Conversation, 2012, 92 x 72 in. Quilts—the word conjures bed covers made with tiny scraps of fabric stitched together with a layer of batting beneath a geometric or floral design. Yet today, a kaleidoscopic range of quilts is being made primarily to be displayed on walls. Those who call themselves studio quilters or textile artists create compelling images using traditional and modern techniques that blend classic and unexpected materials. Portraits, walls of graffiti, scenes of everyday life, graphics from ads and social concerns are all expressed with skills both learned at a grandparent’s knee and in M.F.A. lecture halls. Scaled to fill spaces from the diminutive to the enormous, quilts, once seen as craft only, now provoke and delight with the authority of fine art. There’s no question that many of the hands plying needle and thread in the 18th and 19th centuries made works of startling beauty, but it was the nation’s bicentennial in 1976 that revived interest in patchwork and appliqué. While some late 20th century stitchers worked to reproduce antique examples, others, often academically-schooled artists, turned to textiles with a new agenda. By then, Claes Oldenburg and Christo had introduced cloth as components or central media in their work. With cotton fabrics readily available and expanding in color and pattern, it was inevitable that they would be employed in new ways. Describing her work in a 1992 catalogue for a solo exhibition, Work in Transition, Crow says, “I want the simplest of means to achieve the most glorious of results.” Crow, who came from a family of painters and was trained as a ceramicist and weaver, early on realized that she preferred the “clean feel of cloth.” That drew her to experiment with traditional patterns in single efforts, but she eventually evolved to developing quilts in series, deepening her understanding of the endless potential for interaction between color and shape. To the commonly-heard question “is it art,” Crow replies, “People don’t call themselves art painters or art sculptors,” and leaves it to others to decide how to classify it. 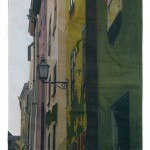 Currently, she is experimenting with large-scale monoprints on fabric incorporated into quilts. James is committed to documenting art-quilt history and supervises graduate students researching the lives and works of notable fabric artists. He has also exhibits his own work for four decades; most recently he was included in an exhibition at the Southwest School of Art in San Antonio. His Rhythm/Color: Spanish Dance (1985) was among the earliest art quilts acquired for the Newark Museum by Curator of Decorative Art Ulysses Grant Dietz. Visions Art Museum, in San Diego, focuses on contemporary quilts and textiles. The museum, which opened in 2007 as the outgrowth of a juried show, is committed to the “promotion and appreciation…of fiber as fine art.” Visions, which stages regular solo retrospectives, will present shows of longtime quilt artists Ree Nancarrow and Caryl Bryer Faller-Gentry in the upcoming 2013–14 season, while also establishing a program of traveling exhibitions. Collectors Warren and Nancy Brekensiek recently donated “Full Deck,” originally a traveling Smithsonian exhibition, to the museum. The 1995 show was curated by Sue Pierre, who invited 54 widely varied quilt artists to represent all four suits of a deck of playing cards. Other quilt-centric institutions showing a mix of the latest and the oldest are the National Quilt Museum in Paducah, Ky., and the New England Quilt Museum in Lowell, Mass. Both museums have diverse collections, with New England holding groundbreaking quilts done by Ruth McDowell and Nancy Halpern. The Texas Quilt Museum in LaGrange welcomes and organizes traveling shows and always presents contemporary works in one gallery. In 2013, traveling contemporary shows “Seasonal Palette” and “Masters II: Art Quilts.” were hosted by the National and New England museums, respectively. SAQA functions as a hub for mutual support, critique sessions, public relations, as well as a conduit for online sales. “In some ways,” says Sielman, commenting on SAQA’s multiple roles, “it’s a virtual quilting bee.” In the last 10 years, the Associates have quadrupled their ranks and grown more diverse. Masters: Art Quilts, Vol. 2 (Lark, 2011), demonstrates the continuing influx of passionate artists such as Isabella Baykova, whose embroidery-encrusted fantasies flow to netherworlds. Then turn to Karin Franzen’s photorealist water birds as they sensuously stretch their bleached, immersion-dyed, screen-printed limbs. Adding texture to fractured geometrics enhances the playful spirit rising from Reiko Naganuma’s work. Back in 1978, a desire to showcase this burgeoning wealth of new textile expression led Nancy Crow and her colleagues to establish Quilt National. Still considered a major proving ground for quilt art, the 2013 biennial, the 18th show, displays dozens of fiber constructions in the Dairy Barn gallery in Athens, Ohio. Kathleen Dawson, QN’s director, notes that the quilts continue to have an impact during the two years after the initial hanging, as the show travels to other venues. Among the pieces sent to viewers in Missouri, Minnesota and California this year were Mary Ann Tipple’s switchable portrait panels inspired by family photos, Katie Pasquini Masoput’s painted suede and satin and John Lefelhocz’s butterfly-embellished Mona Lisa. 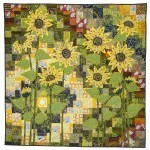 Sielman sees Quilt National as a bellwether for trends in art quilts. Analyzing the 83 works chosen this year, she notes a new, “prevalence of text as an important design element.” As for materials and techniques, she says that many artists are using sheer fabrics “to create subtle color” and, increasingly, photo transfer. Collector Jack Walsh considers Quilt National a primary source for works that are breaking new ground. Inspired by a Michael James quilt, Walsh decided to study the art form. After meeting Penny McMorris in 1992, Walsh relied on her knowledge and his enthusiasm to build a broad collection that documents the movement. “The work is mixed-media worthy of standing in any art show,” says McMorris, who has worked with Ardis and Robert James, served on the International Quilt Study Center board and is co-founder of The Electric Quilt Company. 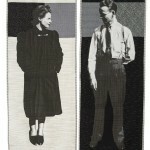 Walsh intends “to support the artists by providing visibility and gaining recognition for them.” He loans the work for museum exhibitions—this fall at the Morris Museum in Morristown, N.J., and in 2014 at the Johnson Art Museum at Cornell University, the Arts Alive program at Elmira College and the Texas Quilt Museum in LaGrange. About 10 percent of his purchases are open-ended commissions intended to spur creativity and “remove concerns about selling.” He notes that one artist reported that this freedom to experiment enabled her to take her work in an entirely new direction. 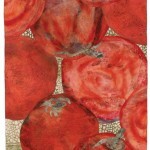 Fiber artist Marilyn Henrion also shows her work in Chelsea at the Noho Gallery. Though her work was already in private and museum collections, Henrion juggled teaching and studio time for many years. In 1999, she joined the Noho, a cooperative artist-run gallery, and focused solely on studio production. With both literature and the city around her informing her work, Henrion’s rhythmic, color-charged designs are always hand stitched. She believes “the presence of the human hand is integral.” Seeking deeper dimensionality, she may add related fiber techniques such as needle punching and rug hooking to her hands-on work. 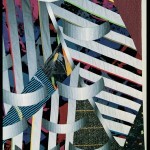 Recently, her Soft City series utilized digital photo transfer of architectural details from her SoHo neighborhood. Commenting on Soft City, Ed McCormack, co-publisher of Gallery & Studio, notes that “the allusion made to gaping portals and windows resembling the eye sockets of skulls.” For McCormack, “even Henrion’s most abstract work has tangential elements.” He sees another example of this “phantom presence” in Disturbances, Henrion’s hand-made stitched silk series in response to September 11. Saturated with hand stitches and found objects, Brooke Atherton’s SpringField was awarded Best of Show at Quilt National 2013. Atherton constructs art quilts depicting pastoral and disastrous journeys by joining hand-worked units. Securing elements with adhesive and using supporting bamboo allows for space-conscious variations when her pieces are hung. Explaining that her initial plans “often digress, or just get lost,” Atherton says, “I seriously consider the effects of time as an element.” Not only does she incorporate calendars, measuring devices and maps in her surface design, the artist also tests her burning, dyeing, rusting and fusing techniques to ensure they will not shorten the life of her finished piece. Represented by Toucan Gallery in her home town, Billings, Mont., she also reaches audiences at Quilt National and Quilt Visions shows. SpringField was one of six art quilts purchased by Walsh at the 2013 biennial. The threads that connect quilts with fine art are strengthening. Diverse in message, media and methods, these textile creations continue to energize. With barely a generation of work to consider, there’s a need for more museum exhibitions and greater gallery presence. Wider criticism will improve collector awareness and build confidence in emerging and experienced artists. Faith Ringgold, whose work is in the Metropolitan Museum of Art collection, has long been represented by Chelsea’s ACA Gallery. In 2001, Ringgold said of those viewing her painted story quilts, “They’re looking at a painting and they’re able to accept it better because it is also a quilt.” Today a widening circle of viewers celebrate quilts as art.